The Romans defeat Hannibal. 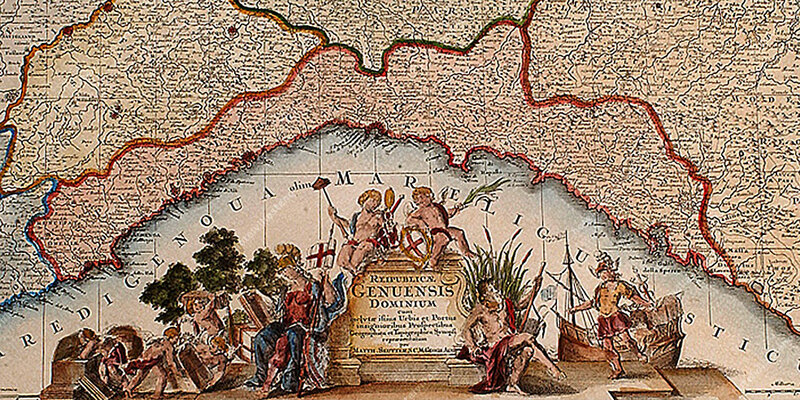 The Ligurians, his allies, are forced to migrate into the Samnium region. According to legend, the area of the Cinque Terre was awarded to victorious patrician families from Rome: the Rubri, Vulnetii, and Cornelii. The earliest community forms in the small village of Albereto, now a part of Monterosso. Roman tombs discovered in the 19th century near the Santuario di Soviore testify to this era. The Longobard king Rothari invades Liguria and sacks Albereto and Soviore. The local population flees to the sea and find refuge in a castle on San Cristoforo hill, whose reddish earth will later give the settlement its name. Marchese Guido degli Obertenghi draws up a deed of donation: this is the first historic document in which the name of "Monte Russo" (> Monterosso) appears. Completion of the parish church of San Giovanni Battista, whose construction began in the 13th century: the population gradually moves down into the valley and begins to inhabit the current town. The Republic of Genoa is annexed by the Kingdom of Sardinia. The Cinque Terre, though remaining geographically isolated, experience a certain degree of economic revival. The railway is completed between Genoa and La Spezia, ending the area's centuries of isolation. UNESCO declares Monterosso and the rest of the Cinque Terre a "World Heritage site". The inhabitants of the small community that has grown up around the church of Reggio leave their settlement: some head inland, others towards the coast, founding Vernazza. Vernazza is named for the first time in a historical document. The town comes under the control of the Fieschi family, which turns it into a fortified base to defend against attacks by Saracen pirates. Vernazza is sold to the Republic of Genoa. A harbour is built for the galleys used in battles with Pisa, and it is becomes a shipyard that can boast the finest shipwrights in Liguria. An economy equally divided between agriculture, fishing, and sea trade makes the village the wealthiest in the Cinque Terre. UNESCO declares Vernazza and the rest of the Cinque Terre a "World Heritage site". Corniglia is named for the first time in a historical document. Due to the support of Pope Innocent IV, the town comes under the control of the Fieschi family. Corniglia is sold to the Republic of Genoa. The Republic decides to build a fort and a circle of walls to defend the village, which has been repeatedly sacked "by infidels and pirates". The ruins of this fortress can still be seen in the upper part of town. UNESCO declares Corniglia and the rest of the Cinque Terre a "World Heritage site". The first settlement is built in the hills of Volastra, a waystation used by the Romans to change horses along the high coastal road that predated the Via Aurelia. The population moves down towards the sea, founding a new coastal settlement. "Manaiola" is referred to in a will. The town passes under the control of the Fieschi family, which builds a fort, one bastion of which still survives on the sheer cliff above the sea. The Ghibellines come to power in Genoa, and the Fieschi are expelled. Four years later the town passes into the hands of Genoa, and from this time on it follows the vicissitudes of this Republic. Manarola is often the target of raids by Saracen pirates. UNESCO declares Manarola and the rest of the Cinque Terre a "World Heritage site". According to local legend (though this is not supported by historical sources) a group of Greek refugees fleeing persecution by Emperor Leo III land at Cape Montenero and settle halfway up the coast, forming small scattered communities. The town comes under the control of the Fieschi family. Riomaggiore is sold to the Republic of Genoa, but remains under the influence of the Fieschi: a period of political stability begins in which the town prospers from maritime and merchant traffic. Riomaggiore is the town that produces the most wine. UNESCO declares Riomaggiore and the rest of the Cinque Terre a "World Heritage site".